We had a simple dinner tonight over at Plus Plus Restaurant Setapak, just the two of us. That was when I suddenly realize that we ordered two very contrasting dishes. Check it out below. 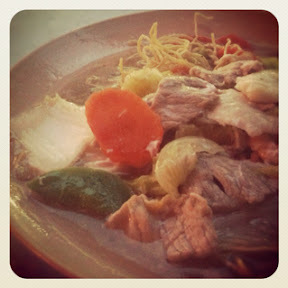 This was Janice's Mee with soup. A rather healthy dish if you asked me. I rarely take soupy dishes, something I should change in order to get a healthier body I guess. Check out what I had. 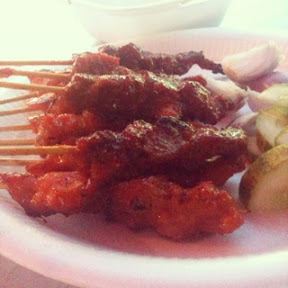 Satay! Lots of it for hungry me. It was priced at rm0.70 each which was pretty pricey but I still went ahead to order it because I had the sudden craving. Then it hit me, how in the world am I suppose to slim down with food like these? This post shall serve as a reminder to myself not to binge too much on fatty food and hopefully change my diet to healthier food.